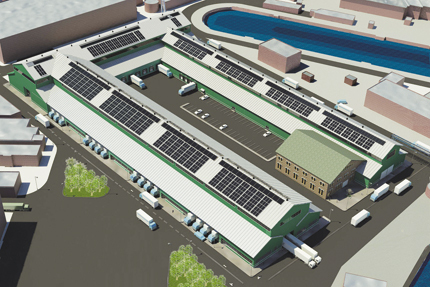 A rendering of the new green manufacturing center at the Brooklyn Navy Yard, designed by Cybul Partnership. As development touched nearly every corner of the city in the last real estate boom, the manufacturing sector, which traditionally takes up a lot of space and yields low rents, was increasingly pinched. With the downturn, the rate of encroachment on industrial areas has slowed, allowing for a green reincarnation of an industry not usually known for being clean. In late October, New York State gave manufacturing in Brooklyn a push in the right direction by chipping in to help build a 220,000 square foot Green Manufacturing Center at the Brooklyn Navy Yard and to outfit an expansion of the Brooklyn Brewery in Williamsburg with green technology. Possible tenants could include a carpet and electronic waste recycling facilities and green building product manufacturers. Kimball sees the growth of green manufacturing as directly tied to new sustainability regulations. “As the city requires the greening of buildings and more clean energy, there are huge business opportunities in this area,” he said. The state is providing nearly $16 million for the project. Amy Anderson, a project manager for the New York Industrial Retention Network (NYIRN), is encouraged by the state’s support. “The symbol that it represents is very important. It shows the state’s investment in green manufacturing and technology,” she said. “It’s a growing subsector. The demand is real.” The design industry is a driving force for the growth of green manufacturing, she noted, particularly in the area of locally sourced interior finishes. The center is the latest push in an ongoing process to make the Yard a sustainable industrial park, including infrastructure improvements like wind powered street lights, porous paving to prevent run-off, and a smaller building with the city’s first building-integrated wind turbines. “We’re trying to green everything at the Navy Yard,” he said. “We want to exceed city standards and have all of our new buildings meet at least LEED Silver standards, which we think will, overtime, command better rents.” Cybul Partnership of Edgewater, N.J. is designing the project, which is expected to be complete in late 2011. Two other LEED certified manufacturing buildings are also in the pipeline at the Yard. As the economy softened, Hindy was able to negotiate a fifteen-year lease in three buildings at that rate, including 13,000 additional square feet of space. “We’re thrilled that it’s worked out this way. A year ago it didn’t seem possible,” Hindy told AN. “Our first preference was always to stay in the neighborhood.” As encouragement, the state is giving the Brewery a $800,000 grant, which will allow the company to build a waste grain recycling facility and a solar water heaters. The additional space, which is being designed by Fradkin & McAlpine Associates, will allow the facility to produce more than 50,000 barrels a year up from 8,000. Hindy agrees that landlords often hold out for commercial tenants who are able to pay higher rents. “Though I don’t think it’s a forgone conclusion that industrial tenants would be clamoring to fill those spaces,” he added. A version of this article appeared in AN 19_11.18.2009.